Help us save the Washington Horseman Tacoma Unit #1!!! The Tacoma Unit has been the center of the horse show world in the Pacific Northwest for decades. This wonderful venue has touched the hearts of so many people. 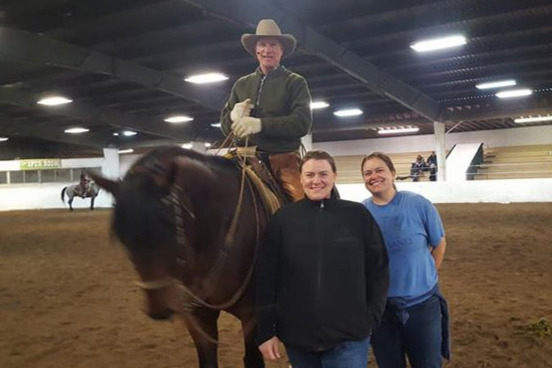 From world champion riders to beginning 4-H kids. People come from far and wide to watch the historic Tacoma Lariettes perform their iconic Black Light Drill Team show as well as to watch Regional Champion drill teams like Fire Storm and Rein N Rowdies perform at PNW Drill Meets hosted at the Tacoma Unit. My name is Sandra Kean-Wolfer. I have been a long time member of the Tacoma Unit #1. I ride there, I board there, and I run my business there. (Horse Play Cafe) Well I did until the arena was closed. The first time I rode at the Tacoma Unit #1 was in 1994. I had a few lessons with local horse trainer legend, Jack Stecker. Who still lives on the property to this day as a caretaker. When I was a kid I would come see the Pierce County Sheriff Posse Rodeo every summer! I would play under the bleachers and watch the cowgirls ride by on their big beautiful horses and I would daydream about being a rodeo princess someday. I started this campaign because I believe losing the Tacoma Unit #1 would have a devastating impact on our horse community. I am raising the funds as an individual for the Tacoma Unit #1 so that we don’t violate our 501(c)5 non-profit status. Like so many of you I want to see this place live on for many more generations to come! With so many horse arenas/venues closing over the years, we are running out of places to show, ride and play. Please help us save this historic equine treasure. What happened: You may or may not have heard that during the big snow storm we had in February, the excessive moisture from the snow revealed portions of the roof on the main indoor arena were failing. [Put technically, there was degradation of the red iron on the z-beam which has resulted in the bottom of the z-beam delaminating away from the girder.] Until the roof can be replaced the Main Event Arena is closed. As a show venue this means a HUGE loss of income. The Tacoma Unit is a 501(c)(5) nonprofit and this is beyond devastating. If funds are not raised or the Tacoma Unit itself cannot get a loan for the work, the Tacoma Unit will likely be forced to close. This would be horrible to not only the local Pierce County horse community but for the entire PNW horse community. I am hoping to raise $200,000 because the cost of this tragic event far exceeds the budget for maintenance and repair. The total cost of repairs for the Main Event Arena is $635,855. All of the money raised will go towards replacing the Main Event Arena. Time is running out. We need funds NOW! From the families that ride here, to the employees that work here and the horses that call this place home, The Tacoma Unit#1 needs your help!